From the very beginning of our lives we are learning how to interact with other people, how to respond to a smile, how to talk to each other, how to ask for things and many more skills that help us to get on with other people. For some the learning is not as natural as it is for others. This may be because of special conditions such as autism, attention deficits and other learning disabilities. Star is such a person, she talks out of turn, talks only about what she wants without consideration to others, has difficulty in seeing things from another person’s perspective, zones out into a world of her own and generally finds it difficult to understand other people. She has received a lot of help with this and is learning these skills that often come naturally to others. We were asked to review a short show about how we can learn these skills. The Show is called Flummox and Friends and you can see a pilot episode here. The show focuses around three inventors and their friends and neighbours. While they invent things to help them with their interactions it’s often their friends and neighbours that show them how it’s really done. The show also has musical pieces and animations which help to re-enforce the messages. It took Star while to become engrossed in the show but I think that was mainly because it was something she was unfamiliar with. She particularly loved the music and animations. She laughed out loud at the characters silly dances and tried to copy them. When we talked about the show afterwards she was more interested in talking about the silly dances than anything else. I could see a lot of her behaviour traits in the main characters of the show and I do think that if it was a show she watched regularly then it would help her with her social skills. I’ll definitely be watching the website for when more episodes are available. Along with the show there are downloadable guides for extended learning for both parents and schools. These focus on the messages Tune In, Connect and Have Fun. Each section has guidelines for talking and learning about these particular social skills. Tune In is about tuning into yourself, those around you and the world around you. This involves self-awareness, perspective taking and and assessing the social context. Connect is about communicating, predicting feelings and sharing and appreciating unique qualities. Have Fun is about using play to re-enforce social skills and aid interaction with others. 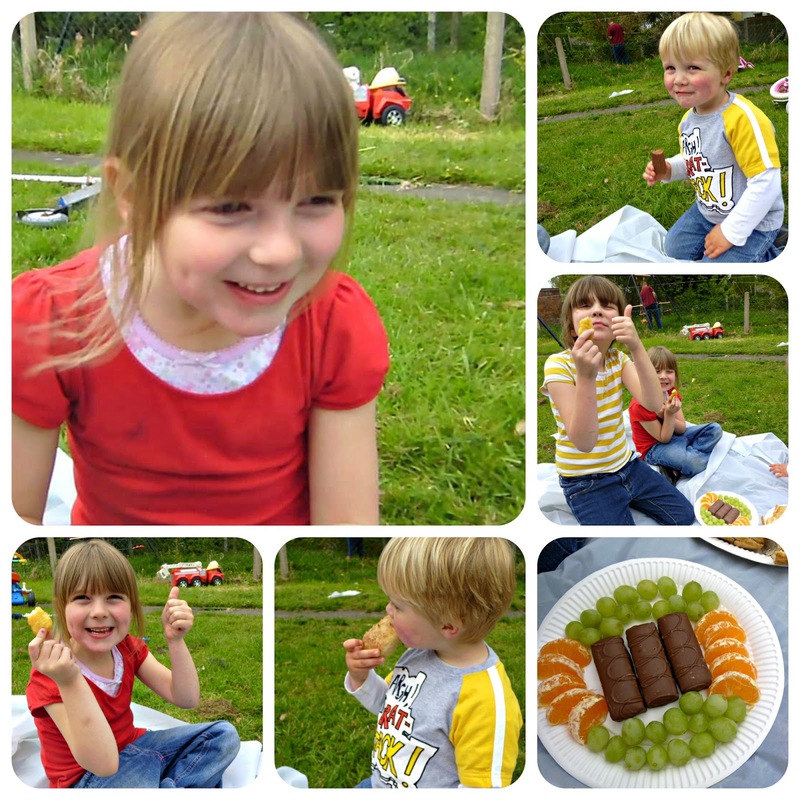 I was really excited about this months Center Parcs Family Blogger Challenge, it was to have a picnic and if there is one thing me and my children love it’s picnics! However, having one proved more difficult than I anticipated because of the wonderful British weather. Sunny one minute, pouring with rain the next. So rather than venture out to our usual picnic venue, the duck pond, we decided to have our picnic in the garden so we could run inside if the weather turned. We were lucky enough for it to stay nice while we were out. The kids have been promised a trip to the duck pond tomorrow to feed the ducks. 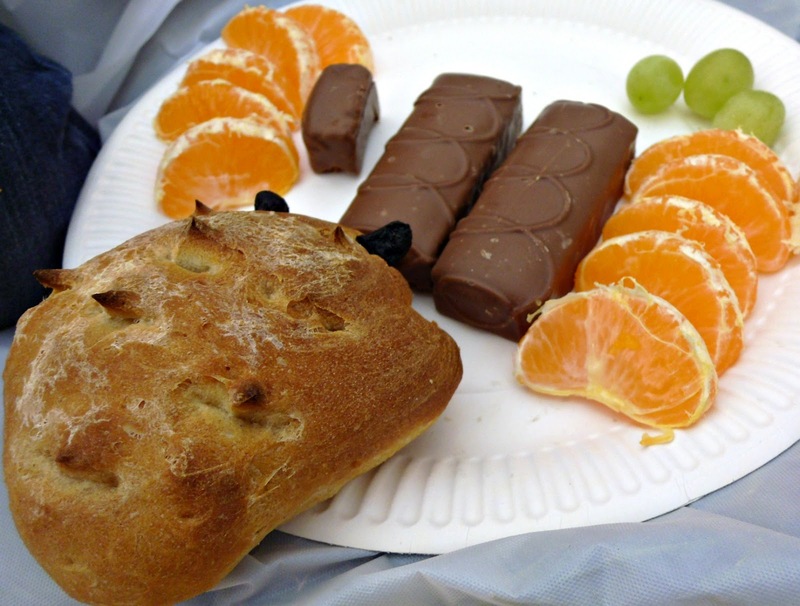 I didn’t really do anything special for the picnic, just a selection of the kids favourite foods, like chicken, salad, sausage rolls and fruit. 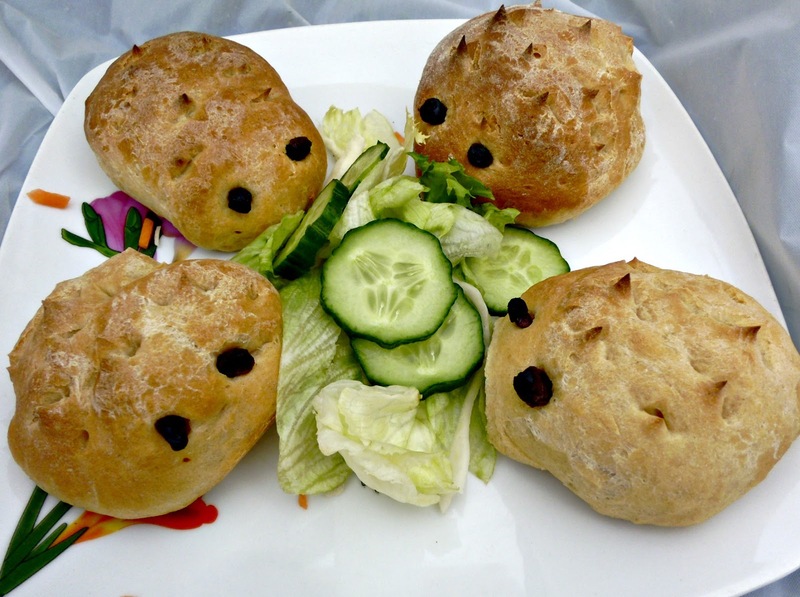 My piéce de résistance was my home made hedgehog bread rolls with raisins for eyes. Even though we only managed to go as far as our own back garden the kids had a lovely time and the picnic got a thumbs up all round. For a chance to become the next Center Parcs Family blogger simply share pictures of your fun filled family picnic on your blog. Visit Tots 100 for full details and good luck! Last time I told you all about my pregnancy with Star which was worrying because of all the bleeding. I also had very bad SPD. Before getting pregnant with Star both me and my other half had had fertility tests, but we never really had an explanation as to why it wasn’t happening. However, it did happen in the end and just after Star’s first birthday we decided it would be nice to have another baby. We also decided to go for it straight away as I wasn’t getting any younger and we could be trying for a long time. Four weeks later I had a positive pregnancy test! Then around six weeks into the pregnancy I started bleeding again. I also had a pain in my shoulder which was really worrying as my midwife told me it could be a sign of an ectopic pregnancy. A visit to the Early Pregnancy Unit showed that it wasn’t but they couldn’t tell me why I was bleeding. I tried to remain calm, I’d experienced the same with my previous baby and she’d been ok. It’s still such a worry though. The bleeding continued and I ended up back at the EPU again at nine weeks and thirteen weeks. A dating scan showed that baby was doing fine and again I tried to be calm. I then had a whole three weeks of no bleeding, but I had fortnightly checks with my midwife. When I had my twenty week scan it was seen that I had a low lying placenta which was in fact covering my cervix. This was given as a possible reason for the bleeding. So for the first time I had a reason, but it didn’t make me feel any better, especially when they told me that if it didn’t move it could prove dangerous later in the pregnancy and I would most likely be having a C-Section. I was booked for a thirty six week scan to see if it had moved. Another animality picked up on the scan was the increased amount of fluid around the baby. They told me that it could be that baby was not swallowing properly or the kidneys where not doing their job. They even said it could mean the baby had a chromosomal problem. I tried to feel consoled with the fact that they did a detailed scan on the baby and believed the kidneys and bladder to be working ok, and I saw baby blowing bubbles which had to be a good sign. Then, with two much fluid I was in danger of developing polyhyrdramnios which could mean ending my pregnancy stuck in hospital and becoming incredibly huge. Suddenly all the bleeding didn’t seem so bad in comparison. 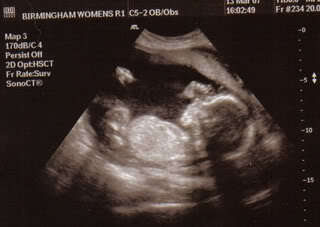 The gorgeous Boo at 20 weeks, perfect in every way, just a shame mummy was not so perfect too. Just a few days after my scan I was back in hospital after a really big bleed and a lot of pain. They blamed my placenta. I was tested for infection because of the pain, but after a couple of days things settled down again. I did, however, continue to bleed sporadically for the next two weeks. I made it to thirty six weeks and went off for my scan, fingers tightly crossed. After much scanning and checking and double checking and even more scanning (I couldn’t say they were not being thorough the final diagnosis was….the placenta had moved. whoo hoo! There was a 5cm gap which was deemed big enough for me to try for a vaginal birth. The estimated weight of the baby at this stage was 7lb 6oz. Wow! big enough to come out already….please! A week later I was bleeding again. Worried that it could be placenta praevia because my placenta was still pretty low I was sent for a check-up. The blood turned out to be from a burst varicose vein! phew! I went into labour while watching Eastenders. The contractions where pretty strong but five mins apart so I expected a fair wait. At 10pm I decided to go to bed. I knew I wouldn’t sleep but hey, it would be nice if I could get some rest. At 11.30pm I was in the taxi on the way to the maternity hospital. On arrival I was examined and found to be 4cm dilated and in established labour. My midwife was a student and she was lovely. Just a few hours after arriving in the delivery room I was pushing. The midwife broke my waters, boy it was like Niagra Falls, I thought it would never end. Then I foolishly hoped that that huge bump had been mostly water and my Boo was going to be really small. By now it was the early hours of the morning and I was shattered. So tired I didn’t want to push anymore, I wanted to sleep. I had to find the energy deep inside to push out my baby. My lovely bouncing 9lb baby girl. so happy I hadn’t found out the flavour at the scan. We’d called her Boo while still inside, and even though she does actually have a name we still call her Boo now! Then we had a little more drama as Boo had passed meconium while inside and was rushed off to have her airway cleared. I could see them working on her in the corner of the room and it was so terrifying. Just a few moments later she was breathing and they brought her over to me. That few moments had felt like a lifetime to me. Then we celebrated because my Boo was the student midwife’s fortieth delivery which meant she became a fully qualified midwife. The magic moment when I met my Boo! There was lots more that I learnt but that was last year and now I’ve just been to Blog Camp Summit this year and learnt a whole heap more. I just wanted to point out that it was last years event that started me out on the path I am now, and I’m come such a long way (don’t bother going back to look at the rubbish posts in my history, I’ve deleted most of them) and I’ve made so many new friends. I’ve gained so much from my blogging but my proudest moment has to be becoming a finalist in the MAD blog awards. So you see, these brilliant Tots100 events can bring you great rewards. So what did I learn this year? 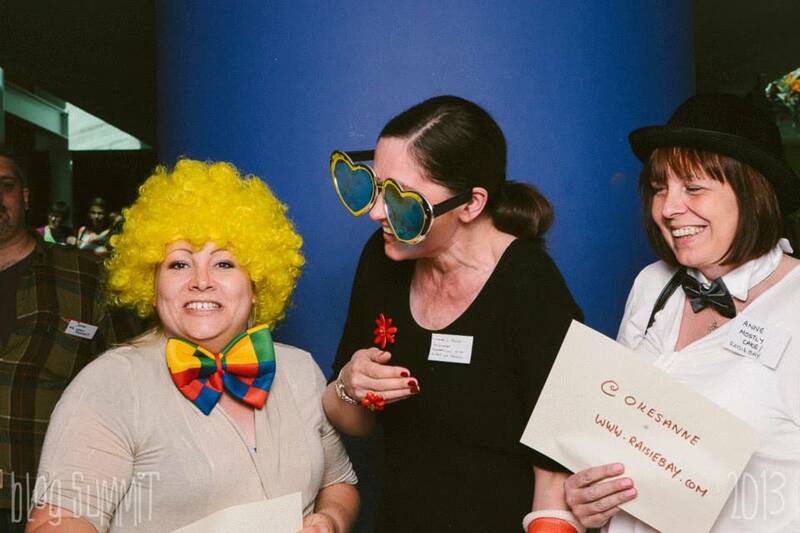 A grill session with some great bloggers ( Sally from Who’s the Mummy, Chrissie from Mediocre Mum, Helen from Fuss Free Flavours and Ruth from Geek Mummy) taught me that it’s ok to take time out from blogging if you need to. Also, you need to follow your heart and take your blog where you want it to be. Find your voice and do things your way, it’s ok to do reviews and sponsored posts if that’s what you want but you will learn in time how to balance things out and keep your readers happy. One more tip was to make a sock puppet, but the reason why is a secret only for those in attendance. Finally, Sally gave us a quick lesson on the metrics of the Tots100 ranking, which really is quite simple, honestly. An advanced SEO session with Judith Lewis taught me that I need to analyse some brilliant keywords for my blog and create a new page for them to bring in the traffic from search engines. This procedure involves much work and spreadsheets, apparently spreadsheets that have pretty colours work better. I can’t go into too much detail here right now (it was a lot to take in and would take up a lot of this post) but once I’ve had a go and worked it out for myself I may just make a new post to let you know how I get on and if it works. After lunch I went for an interesting talk on Pinterest by Cathy James from NurtureStore. Now, I’ve used Pinterest for a while, I find it a great resource for, well, practically anything I’m planning from parties to picnics, wallpapers to cake decorating. However, I’ve never fully optimised it for my blog, and didn’t really know how. But now I do and it’s pretty straightforward. You can create images specifically for Pinterest to go with your blog posts and you can cross post your images to different but relevant boards (so long as you don’t do it all in one go) Images should be portrait rather than landscape and your boards should be organised on your page with the most appealing images as the cover. Also, up to 50 is the optimum number of boards to own. Apparently Pinterest can bring you lots of traffic to your site and I have to admit I have noticed this from an image I posted from my daughter’s birthday party last year. We also had a talk from some PRs from Frank, Volvo, Parent Dish and Argos which was very interesting. It’s always good to know how the PRs work and how they want to develop their relationship with bloggers. Finally, we had an amusing talk from Andy Cope who told us about his research into why only 2% of us are happy and what we can do about it. In a simple summary you have to stop chasing happiness, for example, stop saying you will be happy when you achieve ‘this’ or you will be happy when ‘that’ happens. Instead you need to chose to be happy anyway. His little tip was to wake up every morning and be thankful that you don’t have toothache. So you need to stop being a mood hoover, moaning about everything and waiting for happiness to happen and instead chose to be happy anyway. I like to think I’m an optimistic person, and I think the best of people and look for the best in situations. Even so I know I’m guilty of chasing after happiness. But now I’m going to just chose to be happy each and every day, and as for the mood hoovers in my life, well hopefully I can make them happy too. Just one more thing to say, did you know, Bloggers are awesome!! It’s true, I met some really lovely people at the summit and I know some of them will be real friends from now on. from left to right Jaime from The Oliver’s Madhouse, Charly from PODcast and me! Did you pick your child’s name before they were born? How did you choose the name, does it have a special meaning for you? When my first child was due I had no idea if he was going to be a boy or girl and although I was quite set on a girl’s name I hadn’t really made up my mind about a boy’s name. However, a soon as I saw him I knew what his name would be. With my second child I gave the honour of choosing to her daddy. As soon as he said her name, a few minutes after the birth, I loved it, even though I’d never heard it before. With the three younger children we used names from loved ones who have passed on for either their first or second names. Emily Davies Writes – What’s in A Name? Where she looks at the meaning behind the names she has chosen for her new baby girl. And Over40andMumtoOne tells us why she chose the names she did for her little boy. Others have told me that they chose names from favourite tv/film characters and some have been careful about choosing names too popular. Some say that the name hasn’t been an option until after baby is born and they can decided what suits them. Some look closely at the meaning of names, some make up their own. You can gain insight or inspiration by looking at top baby name lists for boys and girls. The most unusual name in my family is my little great niece, Nevaeh (pr.Nev eya) have you heard that name before? I hadn’t. Now read it backwards. She’s a gorgeous little girl, truly heaven sent. Celebrities sometimes start trends with names but would you name your child after a fruit like Gwyneth Paltrow who called her daughter Apple? Maybe the name Theodora will become popular after Robbie Williams gave the name to his daughter last year? I didn’t spot a trend when Victoria Beckham gave her daughter, Harper Seven, a number as a middle name back in 2011. Jack and Olivia have been very popular names for some years now but they have knocked off the top spots by Harry and Amelia. See chart below for more popular names for 2012. My children’s names do not make it to the top 10 but are not so uncommon that they don’t feature in the top 20 to 40.
she was Mrs J B. He was Mr S J B. The following infographic from Bounty shows the most popular names of 2012 as well as looking at some trends. It seems that the Royals have had some effect with Harry being top of the list for boys and Catherine rising 21 places. Some of the most unusual names include Tinkerbell and Nemo, seriously? I like that 80% of girls called April were born in April, but only 35% of girls called May were born in May. Do feel free to let me know in the comments why you chose the name you did for your child.